Thousands of people in Hungary have protested against austerity measures introduced by the government, including cuts in early retirement benefits. It was the biggest rally since regular demonstrations against the centre-right cabinet of Prime Minister Viktor Orban began in April. Many were dressed as clowns, after Mr Orban's alleged pledge to send his "clown affairs secretary" to negotiate. The government argues that the reforms are needed to cut spending. Policemen, firemen and soldiers were at the forefront of the demonstrations across Hungary on Thursday. In Budapest, more than 10,000 walked from parliament to the presidential palace. Early retirement for public sector workers was one of the benefits introduced by the Socialist-led government in the 1990s to compensate for low wages, the BBC's Nick Thorpe in Budapest reports. But protesters are now particularly angry that the Mr Orban's government has abolished their retirement rights retroactively, our correspondent adds. The government says it will no longer pay pensions to people younger than the general retirement aged of 65. The reform is affecting policemen and members of the armed forces, who until now have had the right to retire at 45. "I worked as a policeman all my life and for 25 years I thought I could retire," Attila Bogdan, 49, was quoted as saying by Reuters. "Now I feel like someone who had been cheated on by his wife when he became a grandfather," he added. Many protesters sported painted faces and clowns' noses after Mr Orban's alleged remark. 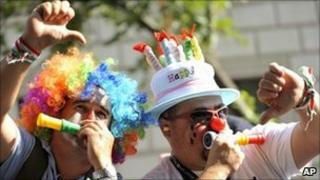 Some in the crowd even dubbed their demonstration a "clown revolution". Mr Orban's cabinet says the reforms are necessary to cut spiralling spending and also boost low employment rates.